A Quilter’s Getaway weekend located at a once popular Dirty Dancing-esque resort in the Catskills is not something you would expect a 20-something to attend. Of the 16 women who attended the weekend, the average age ranged from 65-70, with an outlier at 83. But I have a hobby that most 20-somethings would consider odd, old, or vintage. It all started when I looked around our newly purchased house, saw that there were a ton of windows, and realized that I did not want to pay for all those curtains. My thought was “hey, I need a hobby; maybe I can learn to sew and make curtains for the windows.” The next day I bought a little $80 sewing machine off Amazon, pinterest’ed sewing tutorials all night, and took out at least 25 sewing books from the library. The hobby of sewing items for the house eventually evolved into piecing together pillow covers which then led to my first trip to the local quilt shop and then taking out no less than 50 quilting books (over a number of weeks) from the library. This curiosity started my journey into the world of quilting. 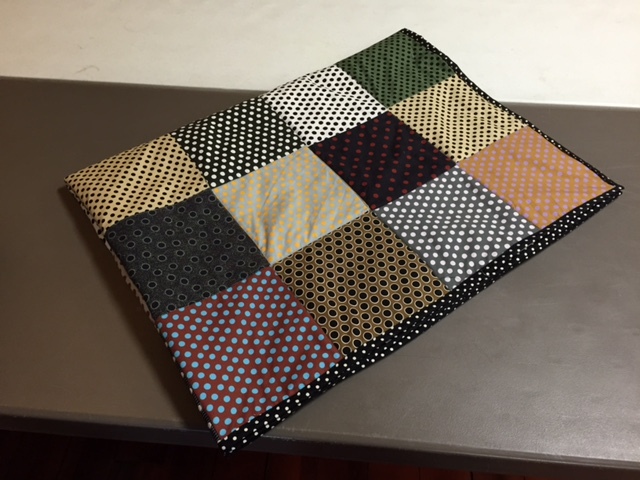 My grandmother was a quilter – a VERY good quilter and prior to 6 months ago, I would have never imagined that I would have taken up the hobby. When she passed away, I had just begun my sewing journey – I wish she could have known what it would eventually become. A few months after her passing my family gathered in central Pennsylvania to visit my grandfather; it was then that he insisted that I take whatever I wanted from her sew room. He explained she would much prefer it be used than just sitting around. I ended up taking rulers, rotary cutters, thread and a bunch of fabric (which I now know to be “fat quarters”). At the time, I thought I would make cloth napkins or maybe a simple table runner – at this point I was still not considering quilting. Then one day, a couple months down the road, it struck me – I should take her fabric and make a quilt for my mother. Bingo! It was decided — from that day on, I was a quilter. Sure, I still make curtains, cloth napkins, and table runners, but the majority of my time is spent cutting, piecing, sewing, and quilting. This brings me back to a very cold November weekend in the Catskills where 16 elderly women plus me met for a weekend of sewing, quilting, laughing, and learning. The weekend was an absolute blast! It is immeasurable the number of tips, tricks, techniques, and overall motivation I received from these women. Their quilts also put my work to shame, but I know that my future work will be so much better thanks to them! Over the weekend, I was able to take the last fabric that my grandmother had purchased before passing and made it into a quilt for my mother; I know she will love it. I now have a long list of people who I want to make quilts for, all of which I know will take years. I have joined a local quilter’s guild, have a room in my house dedicated to my hobby and I am a regular at the local quilt shop where I know the names of all the ladies who work there. Oh and that little $80 sewing machine has been replaced by a much bigger, faster (and more costly) one.